When people ask me why I care so much about the ingredients in our makeup and skincare, I tell them that they would care, too, if they knew the levels of harmful chemicals in their bodies. This issue is universal and personal, yet no one knows to question the ingredients in our products, because everyone assumes they are safe. I was flattered when the Environmental Working Group asked me for samples of my blood and urine six years ago as a part of their Teen Body Burden Study. This study tested teenage girls nationwide for levels of toxic chemicals found specifically in cosmetics and personal care products. The study’s results detected sixteen chemicals from four chemical families (phthalates, triclosan, parabens, and musks #EW) in blood and urine samples from twenty teen girls. Studies link these chemicals to potential health effects like cancer and hormone disruption. Methylparaben and propylparaben, synthetic preservatives that have been linked to cancer, were found in every single girl tested. Thirteen hormone-altering chemicals were found in my own body. 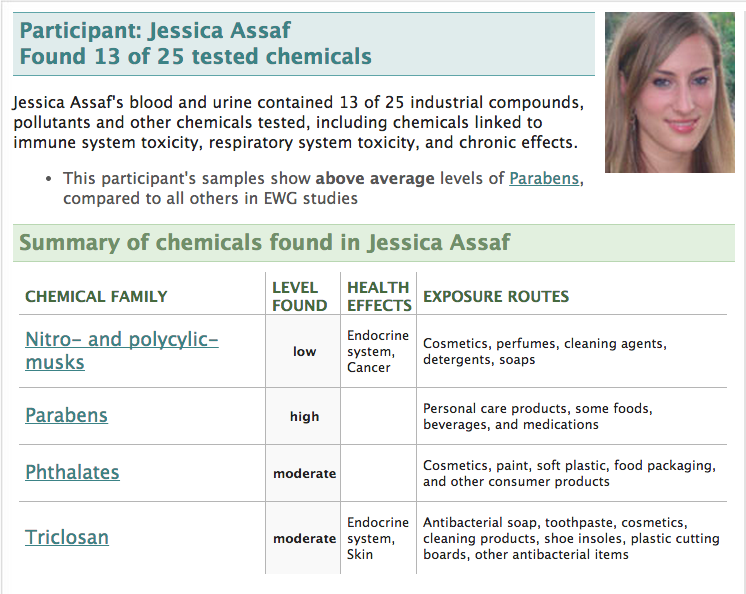 And not only that, but my samples showed above-average levels of parabens compared to the other girls tested. But guess what? As freaky as it was to hear that toxic chemicals are accumulating in my body from all those years I spent thinking MAC eyeshadow and L'Oréal mascara were the best things that ever happened to me, I decided to use the fear as momentum. These scientific results are empowering; they are all the evidence I need to really take a stand against the unregulated beauty ugly industry. Why should we wait around for cancer or reproductive harm to realize these chemicals don’t belong anywhere near us, let alone in the products we rub on our skin every single day?